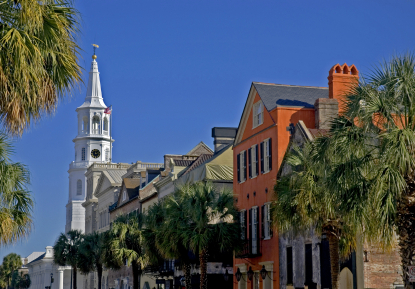 Two Hours/ $20 per person/reservations requiredï¿½ tour begins at the Historic Charleston Foundation Gift Shop at 108 Meeting Street, across from the Mills House Hotel, and at the corner of (cobblestone) Chalmers Street. Please come in the gift shop, where there are bathrooms and refreshments, and browse the incredible array of historic furnishings, books and gifts. The tour route can vary, and will wend approximately 16-18 blocks through the French Quarter, South of Broad, White Point Garden, and The Battery. Points of interest will include colonial churches and graveyards, historic parks with monuments and cannons, cobblestone streets, classic architectural styles, wrought iron gates, gardens and flowering trees, old taverns and wharves, earthquake plates and fire marks, former cotton warehouses and factories, alleys famed for pirates and duelists, and incredible views and stories of famed Charleston Harbor. Group Walking Tours at 10:30am and 2:30pm according to schedule - see site calendar in the "Book Now" tab for scheduled days and times. Leaving from 108 Meeting Street, Historic Charleston Foundation Shop (corner Meeting and Chalmers Streets).Reservations are required, and please check calendar on "Book Now" tab for available days and times. ***Please note that all internet reservations must be confirmed by e-mail. Reservations of two or more are secured with a credit card with a 48 hour cancellation policy. Michael offers a limited number of exclusive private tours for families, friends and groups. The fee is $400 for a two hour private tour. Availability depends on the season, time of day, and number of guests. These tours can be tailored to focus on various aspects of Charleston, as well as offering a more intimate touring experience. Please call Michael directly at 843-478-4718 or e-mail at tours@charlestonfootprints.com to inquire.